The Happy Loner is my main perzine. It talks about anything from social interactions from the point of view of a solitaire, pedestrian adventures, making real friends, sense of self, everyday life tips, reflexions about the world we live in, expectations, dreams, what is really important or not, depression and positive outlook, postal mail, tea, typewriters, bus rides, cracks in the sidewalks, thunderstorms, sunny days, cats & trains. The latest issue The Happy Loner #7 - re-affirming self, Feb 2017 is OUT !! GET The Happy Loner #7 on ETSY !! 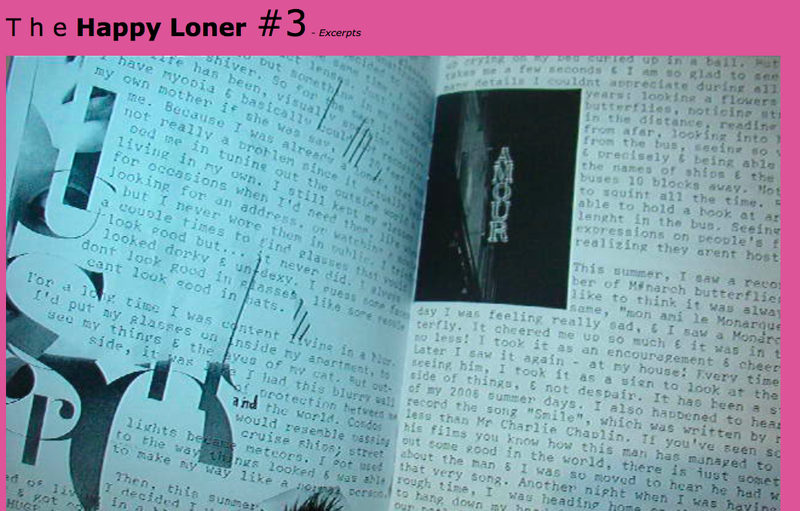 GET the latest issue of THE HAPPY LONER ! Click here ! More details about The Happy Loner #6 (the controversial, GENDER issue !!! ), HL #5 and HL#4 to come . . . Here are a few excerpts from the Happy Loner #3, from an old website of mine. It gives you a good idea what you are in for !!! The Happy Loner #4 (October 2014) gives the round-up of what I've been doing for the past 8 years. The issue is dedicated to Aimé Bourret Straightheart, my Norwegian Forest Cat companion, who passed away in August. It gives you the latest news on Marcel my accordion-playing neighbour ( a former mascot of "Orange & Blue"), the changes in my neighbourhood in Lévis, the dish on my new cutiepie stained-glass-artist husband, as well as some reflexions on "Walking with your heart open" & "An Atheist's Belief". 28pp, half-size.